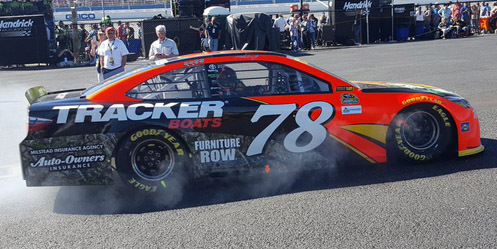 Martin Truex, Jr. picked up the 5th last-place finish of his NASCAR Sprint Cup Series career in Sunday’s Hellmann’s 500 at the Talladega Superspeedway when his #78 Bass Pro Shops / Tracker Boats Toyota fell out with engine failure after 41 of 192 laps. The finish, which came in Truex’s 401st series start, was his first of the season and first in a Sprint Cup race since another early engine failure at the 2014 Daytona 500, 103 races ago. What Truex, Jr. and Furniture Row Racing have done between their two most recent last-place finishes has been nothing short of remarkable. After a difficult 2014 season both on and off the track where his girlfriend Sherry Pollex went through cancer treatment, Truex, Jr. roared back in 2015, claiming his first victory in more than two years at Pocono, one of eight Top Fives and 22 Top Tens. 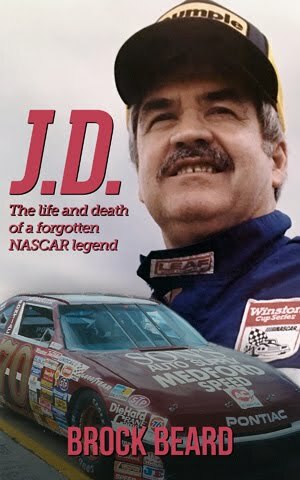 His torrid pace continued through the fall, culminating with a spot in the Final 4, a 12th-place finish at Homestead, and a career-best 4th in the final standings. This year, Furniture Row Racing’s technical alliance moved from Richard Childress Racing to Joe Gibbs Racing, and with the move from Chevrolet to Toyota came new part-time sponsorship from Bass Pro Shops. 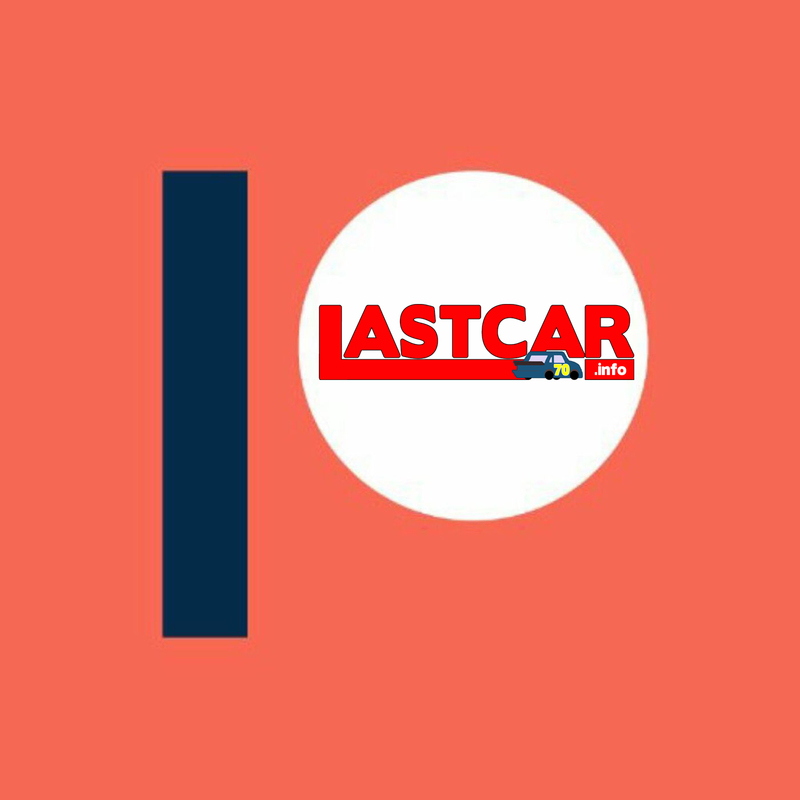 The new black-and-orange car debuted in the Daytona 500, which Truex nearly won until a last-corner, last-moment surge from Denny Hamlin in a photo finish. Truex scored his first win of the season with perhaps the most dominant performance in NASCAR history, leading 392 of 400 laps in the Coca-Cola 600 after winning the pole. Another crown jewel win came in the Southern 500, and he cruised into the Chase with wins in two of the first three races at Chicagoland and Dover. When the series returned to Charlotte, however, driver and team began to struggle. 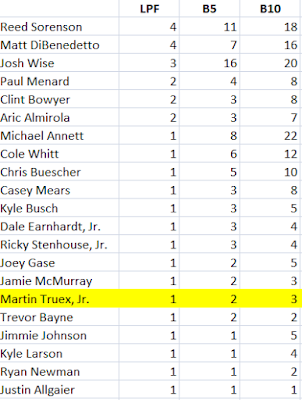 Driving the same car from the 600, Truex never led and finished just 13th, then ran 11th at Kansas, where he led 172 laps before late trouble during the spring. Heading into Talladega, Truex, Jr. sat sixth in points, just 13 points over the bubble, and would need a strong run to earn his way into the Round of Eight. In qualifying, Truex, Jr. seemed headed in the right direction. He won the pole for what would be Toyota’s 1,000th NASCAR national series race. Controversy reigned, however, as it was reported that front jack screws were confiscated from the #78 before qualifying, potentially encumbering his finish with a post-race point penalty. 43 drivers were originally slated to attempt Sunday’s field, which would have been the biggest entry list since the Daytona 500. 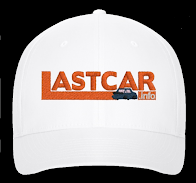 Would have, that is, had The Motorsports Group not withdrawn Josh Wise on Monday, then Premium Motorsports pulled Cole Whitt on Friday. When qualifying was done, David Gilliland was the only driver who missed the field, his #35 Dockside Logistics Ford from Front Row Motorsports missing the field by just under two-tenths of a second. Starting last on Sunday was David Ragan in the #23 sweetFrog Toyota, but he soon had company. Three Joe Gibbs Racing cars driven by Matt Kenseth, Carl Edwards, and Kyle Busch all fell to the rear and would remain there for the day, looking to advance with their existing point cushions. Joining them was Reed Sorenson, who had qualified a surprising 12th in Premium’s second car, #55. Driving what appeared to be the #98 that Cole Whitt nearly got into the Top 5 during the spring race, Sorenson was fastest in the first round of qualifying, then anchored the final round. Unfortunately, Sorenson’s lap was due to a different kind of oil Premium used just for qualifying and would not be appropriate for the race. With NASCAR’s impound rules in place, the #55 team decided against changing the oil after qualifying, and would instead replace it during the race. A similar strategy was used in 2008 by the Wood Brothers, who locked-in their driver Jon Wood with a fast qualifying lap, then pulled behind the wall in the early laps to re-attach belts removed from the motor to improve speed. As with Wood, Sorenson pulled behind the wall on the first lap for the oil change, dropping him to last. He returned to the track on Lap 13, 12 circuits behind, and ran the rest of the race in the Bottom Five. Truex, Jr., meanwhile, led 2 of the first 13 laps, then remained near the front as Brad Keselowski and Chase Elliott battled for the top spot. During this green-flag run, Truex, Jr. noticed a vibration which he originally believed to be a tire. He managed to make it down pit road for his first scheduled stop, but the vibration was still there, and NASCAR reported there was smoke coming from the side of his machine. Then, on Lap 42, it all went wrong. The engine let go, and #78 pulled to the inside of Turn 1, flames coming from beneath his car. The problem was terminal, and Truex, Jr. was done for the day. Low attrition meant that Truex, Jr. was not officially eliminated from the Chase, however, until the end of the race, when many of his fellow Chase drivers survived with good enough finishes. Many, that is, except 38th-place Brad Keselowski. Continuing on his dominance from the spring race and needing a strong run after a late crash at Kansas, Keselowski was untouchable, locking-up the bonus point for most laps led by pacing 90 of the first 145 laps. Debris on the grille of his #2 Miller Lite Ford caused him to surrender the lead to Ryan Blaney in order to clear it away, but it was too late. 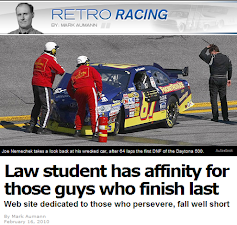 Heading down the backstretch, his engine let go as well, ending his own Chase hopes. 39th went to Casey Mears, who wrecked at pit entrance with Greg Biffle and Jeffrey Earnhardt on Lap 114. 37th went to Sorenson, who came home 12 laps down, still under power. Also going the distance was 36th-place Alex Bowman - barely - who spun from the Top 10 on Lap 187, damaging the underside of his #88 Mountain Dew Chevrolet. Next week at Martinsville, the #88 will again be driven by Jeff Gordon, the defending winner of the event. Turning heads on Sunday was Brian Scott, who ran near the front most of the day and steered his #44 Goody’s Ford to a 2nd-place finish, even threatening to take the win from leader Joey Logano. It was a tremendous run both for driver and team, one week after Richard Petty Motorsports teammate Aric Almirola picked up his second last-place run of the year. Almirola also finished in the Top 10 on Sunday, coming home 8th. *Truex is the first polesitter to finish last in a Cup race at Talladega since April 22, 2001, when Stacy Compton’s #92 Kodiak Dodge, fielded by Melling Racing, also led 2 laps and lost the engine after 116 laps of the Talladega 500. An interesting side note: Compton’s crew chief that day was Chad Knaus. 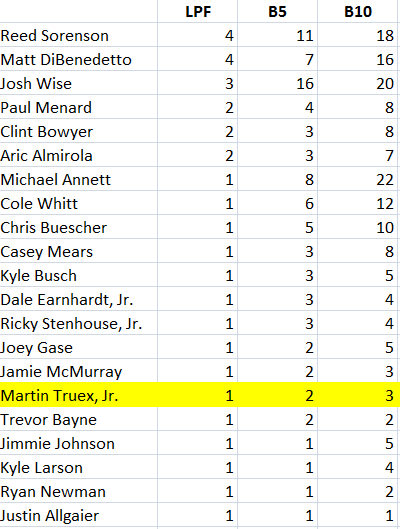 *Truex is the first driver to finish last with at least one lap led since November 3, 2013, when Michael McDowell’s unsponsored #98 Phil Parsons Racing Ford led 1 lap of the AAA Texas 500 at Texas, then retire with a vibration after 27 circuits.